Environmental defenders being killed in record numbers globally, new research reveals. Land and environmental defenders are people who take peaceful action, either voluntarily or professionally, to protect the environment or land rights. They are often ordinary people who may well not define themselves as “defenders”. Some are indigenous or peasant leaders living in remote mountains or isolated forests, protecting their ancestral lands and traditional livelihoods from business projects such as mining, dams or luxury hotels. Others are park rangers tackling poaching or illegal logging. They could even be lawyers, journalists or NGO staff working to expose environmental abuse and land grabbing. Global Witness uses online searches and its extensive network of local contacts to source evidence every time a land or environmental defender is reported as murdered, or as having been abducted by state forces. A number of criteria must be fulfilled for a case to be verified and entered into the Global Witness database. A credible online source of information is required with the victim’s name, details of how they were killed or abducted (including the date and location), and evidence that s/he was a land or environmental activist. In some cases, specialised local organisations are able to investigate and verify the case in-country, meaning that an online source is not necessary. Global Witness includes the friends, colleagues and family of defenders if either they appear to have been killed as a reprisal for the defender’s work, or because they were killed in an attack which also left the defender dead. While Global Witness endeavours to keep its database updated in real-time, verification of cases can be time-consuming, meaning that the names of some individuals are added weeks, or even months, after their death. Why does Global Witness say that its data is incomplete? There are a number of reasons why the information in Global Witness’s database is likely to be incomplete. Many killings go unreported, and very few are investigated by the authorities, which is part of the problem itself. Suppression of the media and restrictions on human rights in some countries reduces the number of organisations and outlets documenting killings. In high-conflict countries it can be difficult to verify that a killing was linked to somebody’s activism. Some countries are likely to be under-represented because principal searches are currently limited to English, Spanish, Portuguese and French. Global Witness’s network of local sources is also stronger in some regions than others. The the aim is to commemorate all human rights defenders who have been killed for their peaceful work in defense of human rights since the United Nations Declaration on Human Rights Defenders came into effect in 1998. Front Line Defenders have taken a policy decision to only include a case with the permission of the family because of the risk of re-victimisation. Repressive governments continue to kill human rights defenders because they think human rights defenders are expendable people, that the killings will have no consequences and that the HRDs will soon be forgotten. The Memorial would be an important tool in the fight against impunity and to keep the flame alive. The Memorial and the participation of national and international NGOs will provide the basis for an international campaign with the theme “Stop the Killings”, which will be launched in the first quarter of 2018. The 17th EU-NGO Human Rights Forum took place in Brussels on 3 and 4 December 2015, bringing together hundreds of civil society organisations from across the globe, representatives from international and regional human rights mechanisms and from the EU institutions and Member States. The Forum is a joint venture between the European External Action Service (EEAS), the European Commission, and the Human Rights & Democracy Network [http://www.hrdn.eu/index.php?menu_selected=122&language=US&sub_menu_selected=768]. The overarching theme for this year’s Forum is Protecting and Promoting Civil society Space. In her address to the Forum, High Representative of the Union for Foreign Affairs and Security Policy, Federica Mogherini, stated: I believe that the civil society has a crucial role to play in any policy and in our foreign policy. It is not only a key player, but a main driver for change in all societies, in terms of democracy, good governance, resilience, cohesion, promotion of fundamental human rights. Freedom of expression is one of the most powerful weapons against radicalisation and terrorism. To better protect our citizens we need above all to build strong democratic institutions and a healthy democratic dialogue. I am very often asked whether security should not be the main focus, more than human rights. But there is no security without human rights”. The theme of this year’s NGO Forum – Protecting and Promoting Civil Society Space – reflects the EU’s strong commitment to put Freedom of Association and Freedom of Expression at the heart of the EU’s human rights policy as essential foundations for democracy, rule of law, peace, stability, sustainable inclusive development and participation in public affairs. This year’s event saw contributions from the current UN Special Rapporteur on Freedom of Association, Maina Kiai; the UN Special Rapporteur for Human Rights Defenders, Michel Forst; Vice-Chair of the European Parliament Subcommittee on Human Rights, MEP Barbara Lochbihler; the Secretary General of the Community of Democracies, Amb. Maria Leissner; Sakharov Prize recipient Memorial, represented by Oleg Orlov; alongside many representatives from civil society, Human Rights Defenders, NGOs, the EU Institutions and many representatives from EU member states. The forum looked at the recent EU Guidelines on Human Rights Defenders and the EU Guidelines on Freedom of Expression, as key tools enabling the EU to promote and protect freedom of opinion and expression and to counter the clear and disturbing trend over the last few years towards an increasingly restricted space for independent civil society as well as outright threats, intimidation and violence that civil society organisations and representatives, journalists, media actors and other individuals face in many countries across the world because of the exercise of their rights. Given the scale of the problem and its constantly changing manifestations, urgent action is required not just to understand the scale and evolving nature of the threats, but particularly to identify ways to achieve effective and concerted policy responses and counter actions. The EU is committed, as indicated in the EU strategy on human rights and democracy and its Action Plan (2015-2019), to address threats to civil society space, through actions that support laws and policies to protect human rights defenders; report on and counter threats to civil society space; and oppose unjustified restrictions to freedoms of assembly and association. Engagement with civil society is essential for the ongoing work the EU is undertaking to help realise human rights, indivisible and universal for all people. The Forum discussions provided a significant opportunity for an interactive dialogue among representatives from the EU member states, the European Institutions (European Parliament, Council, European External Action Service, European Commission) and global civil society and human rights defenders from all over the world, working on the promotion and protection of human rights. The outcome of the Forum will be an important stepping stone for ensuring effective EU action and future policy developments in this field. “It’s hard for me to believe that Andrei Mironov is dead” writes Olivia Ward, Foreign Affairs Reporter of the Toronto Star on 25 May 2014. Indeed a terrible shock. I met him for the first time in 2004 when he accompanied the MEA Laureate Lida Yusupova of Memorial to the ceremony in Geneva. According to an Agence France- Presse report from Slavyansk, Ukraine, the veteran Russian human rights defender and sometime war zone fixer, used up the last of his nine lives on Sunday. He was acting as a translator for Italian photojournalist Andrea Rocchelli, who was also killed. According to a French photographer who escaped with leg wounds, the two men were hit by shrapnel from mortar shells as government troops and pro-Russian separatists continued to battle for territory in eastern Ukraine. “Andrei dodged so many bullets in his decades of battling impunity that it is hard to believe he is gone. It would be harder still if the truth were buried along with him” concludes Olivia Ward, who covered the former Soviet Union as bureau chief and correspondent from 1992 to 2002. For the full story see: Death in Ukraine: bitter end for Russian human rights hero | Toronto Star. 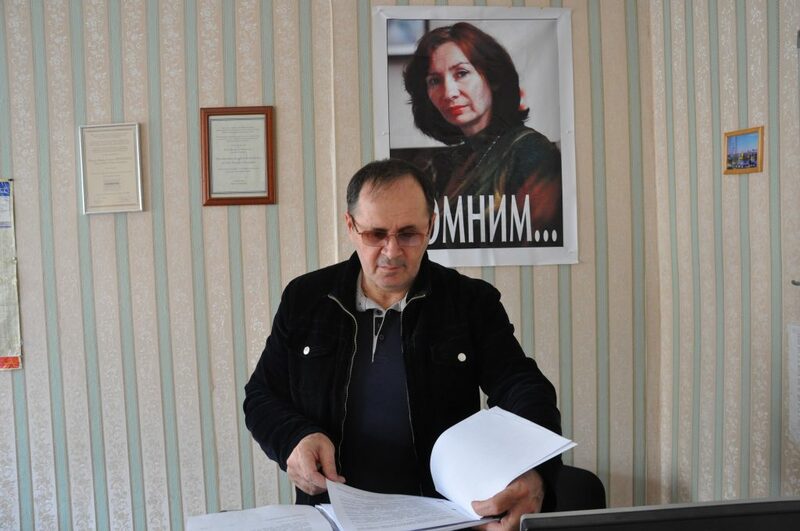 In a hearing observed on 8 April by the Observatory for the Protection of Human Rights Defenders (FIDH-OMCT joint programme), the Saint Petersburg City Court upheld that the Anti-Discrimination Centre (ADC) “Memorial”, a prominent Russian NGO was performing the functions of a “foreign agent” and had to register as such for its human rights work. On 6 February 2013, eleven Russian NGOs lodged a complaint with the ECtHR alleging that the ‘Foreign Agents’ law violates four articles of the European Convention on Human Rights, namely Article 10 (Freedom of Expression), Article 11 (Freedom of Association and Assembly), Article 14 (Prohibition of Discrimination), and Article 18 (Limitations on Rights). On 13 August 2013, Kostroma Centre for Civic Initiatives Support lodged a complaint with the Russian Constitutional Court arguing that the ‘Foreign Agent’ law violates five articles of the Russian Constitution, namely Article 19 (Equality before the law), Article 29 (Freedom of ideas and speech), Article 30 (Right of Association), Article 32 (Right to participate in managing state affairs), and Article 51 (right not to give incriminating evidence against oneself). On 30 August 2013, the Russian Human Rights Ombudsman, Vladimir Lukin, also lodged a complaint with the Constitutional Court against certain provisions of the ‘Foreign Agents’ law. In particular, the Ombudsman argued that the definition of terms ‘foreign agent’ and ‘political activities’, as provided by the law, are politically and legally incorrect. As a concrete example: on 21 November 2013, a year after the law came into effect, Amnesty International Norway, LLH (the Norwegian LGBT Organisation) and the Norwegian Helsinki Committee called themselves for one day foreign agents in solidarity with Russian organisations who struggle to keep their work going (see also in Norwegian: http://www.amnesty.no/agent). Of course, people on the ground know best what will work, but I think some form of ‘counter-defamation’ should be tried. It would benefit Russia and could de-motivate the authorities in other countries watching what happens in Russia.